It was 3:30pm and Rwanda National Police Officers were ready for action. It was a last resort option after several attempts to have the late Assinapol Rwigara’s family members appear before CID for interrogation. Officers swung in, prepared for any outcome. A well equipped squad pulled off at the closed gate. One of the officers come out of the van and approached the gate. He rings the bell and several times. He consults his supervisor what to do next. Shortly before their conversation ends, a pickup arrives with tolls. A ladder is mounted on the gate. One of the officers climbs and checks the gate setup. Immediately the gate is opened. Journalists and Police officers dash into the compound. Two house helpers are standing at the verandah witnessing the events as they unfold. They say no word. The lead officer goes to the main door and knocks. There is no sign of anyone opening the door. He does not bother asking the two house helpers. They look worried and frozen. The compound is already occupied by Police and journalists documenting every move. There are two wings of the house. One on the right side from the east as one drives from downtown and the other on the west side driving towards Kiyovu. The main gate faces the south towards Kiyovu Ky’abakene. Five vehicles are parked in the compound. Four SUVs and a sedan. The officers rash to the west side. It is a one storied unit. The walk to the stairs. We dont know how the door was opened so quickly. It likely was not locked. Officers walk into the sitting room. It is littered with belongings of all sorts. The action is so fast, there is no time to identify what they are. Off the officers go. They walk down stairs to the ground floor. They move around and there is no sign of a living soul. Quickly they turn to the east side. As they walk to the east side, some officers begin to fibble. They are worried. Could it be thats they family escaped? “No, not possible,” the team leader says. “Let’s go on the other side,” he commands. They walk towards the back of the house. There is a door to the kitchen. It is closed and covered with a curtain, but there is some space where one can see through the inside. No movement at this time. Suddenly everyone goes silent. Journalists are given a no-crossing-line. We observe from a distance. The family is heard praying. Clearly, they know the house has been raided and bless their souls. There is a conversation going on between the officers and the family through the door, but journalists cant hear a word. Finally the door opens. One of the officers signals journalists. “Please come,” he says. For every move, the commander seems to be giving an update to his supervisor over the phone. The rash for the first-hand view is real. Meanwhile, the rain is showering us. Everyone squeezes inside the dark kitchen. Every time one switches on the light, the family witches it off. Everyone is talking over their voice. The mother is silent, holding two Bibles in her hand. But she has a gloomy face. The bitterness on her face is unimaginable. 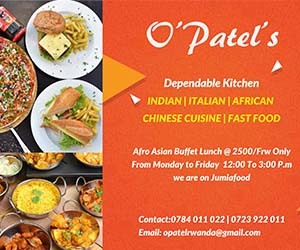 The two daughters, Diane Rwigara and Anne Rwigara are bitter too. The two brothers, Aristote Rwigara and Arioste Rwigara are also talking. “What are you here for, what are you doing here?” Diane is yelling on top of her voice, holding a transparent polythene bag with a slice of pizza, and bread in her left hand. It seems the family was running out of supplies. They have been stuck in the house for almost a week now. “What have we done?” one of the brother insists. “You will be told what you are charged with at the CID,” the lead officer responds. It seems they were ready for an arrest. Anne, and the two brothers are wearing hoodies. Diane is dressed in sneakers, a pair of jeans and a top. During this whole scuffle, the commander is trying to engage the family in a conversation, but he cant be listened to. Too many words, including insults and he can’t pick anything now. “You killers, thieves, monsters, get out out,” Diane says. Her brother chips in, before Diane turns back into his face pointing a finger at him, “Tais-toi (shut up),” she yells at him. “You took all our money, our cell phones, everything, how did you want us to come to the Police.” What are we left with?” she asks the officers. The commander is running out of time, but he has controlled his tempers. Completely cool, but tough in a way. No one sees the other clearly. The room is dark. He has maintained calmness, and composure. It does not seem to work out for him and his team looks impatient. He pulls out three warrants. One for the mother, and two for the sisters. They reject the warrants. Diane pulls one and almost tears it into pieces. As the dram heats up. He gives an order before the house gets messy. The drama is becoming uncontrollable. “Out, lets go,” the commander orders. As we follow outside to the compound, the mother realises the arrest is real. Not a prank. She bursts. “You murderers, killers, thieves, where are you taking us?” she screams. “give me my Bible,” she demands from one of the sons. A Police van is parked into the compound, facing the exit. The family disperses. The rain is escalating. Diane takes a step back. Leans against the table on the verandah. Diane, do you want to give a statement, I ask her. “I am being persecuted,” she says. “These charges are fake,” she adds. The drama is live. The commander needs to take charge. You can see him ordering suspects be handcuffed and loaded into the van. “It is has become a joke, get out these jokers,” he orders. No journalist has asked a question yet, accept the one I asked Diane. They are in a wow moment. Mouth-zipped. No foreign media. Outside, neighbors are watching the whole spectacle through the wide open gate. The young brother jumps into the van. His elder brother gets into the way. Denies sisters and the mother to enter. It is getting nasty. “We are not getting anywhere,” he says. The mother also insists. The family is aggressive. Police officers are in a scuffle. The family is resisting. Anne, however, is already in the van, sitting at the side window. “You, look at you, are you not the one who was interviewing me the other day?” she tells me with disgust. The elder brother tries to manhandle officers after the commander orders that the mother, Adeline Rwigara, be handcuffed for refusal to board the van. “I dare you,” he says, grabbing her mother by his chest with two arms. Officers decide to pull him aside and handcuff him. He then cools his tempers after the mother is forced into the van. The van is locked and off they drive to the CID. The elder brother is released. He dashes to the house, picks a car key and drives behind the van to the CID. Two harmless healthy dogs are loitering in the compound. One is barking from behind the house. The house helpers are watching the drama as it ensues. He is folding his hands, frozen, terrified, and seems not to know what to do. Have they been in this house all this time? I ask. “Yes, where else would they go to?” Mahoro says. All this time, the lawyer is no where to be seen. At the CID, the family has cooled down. They are smiling and gentle. No one would believe they were involved in a fierce fight with the officers an hour ago. Where is their lawyer? I ask the commander. “I don’t know, I haven’t heard from him,” he says. He rings him right away. “Where are you?” he asks him. “Are you aware your clients are here at CID?” he says. The lawyer seems to have been told the family is at the CID. “Ok, how did you know?” he asks him. He tells me the family had just contacted him a while ago. No one knows how. Meanwhile, Police Spokesperson ACP Thoes Badege calls for a press briefing after the family is taken to a CID reception room. ACP Badege says after the search into their house last week, they were brought to CID for interrogation and were requested to appear before CID for further interrogation by their will, but they declined to respect three consecutive summons. “We applied article 48, which is a warrant to bring someone by force,” he said. 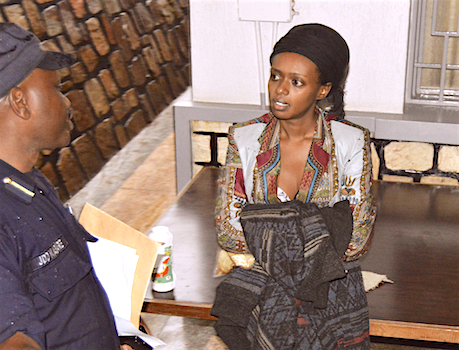 Police maintains the family has to answer charges of tax evasion in the range of Rwf5 billion since 2012. Tax evasion contravenes articles 369, 370, and 671 of the penal code. If found guilty, the culprit could serve a jail term of more than two years, but not less than three months and a fine equal to the evaded tax. As for Diane Rwigara, she is charged with forging most of the signatures she submitted as requirement to be eligible to run for president, of which were basis for he disqualification. The trio; Anne Rwigara, Diane Rwigara and their mother Adeline Rwigara will be produced by prosecution before court at a date soon-to-be communicated once investigators complete putting together their charges. You can get more details of how the case began from our earlier related stories. Keep checking our site for updates.